Ultimate Chicken Horse, the party platformer where friends build the level as they play, makes the jump to PlayStation 4 on December 12th, with Xbox One and Nintendo Switch coming soon after. The console release will coincide with the Elephantastic Update, a massive addition of new content for all platforms featuring a brand new Elephant character, new Jungle Temple and Volcano levels, new platforms and traps, as well as an exciting new game mode. In Challenge Mode, players can build, save, and share custom platforming levels with their friends and with the world, competing on global leaderboards for best times. A level discovery system will allow players to find trending levels, categorize them by difficulty, or find levels that friends have made. 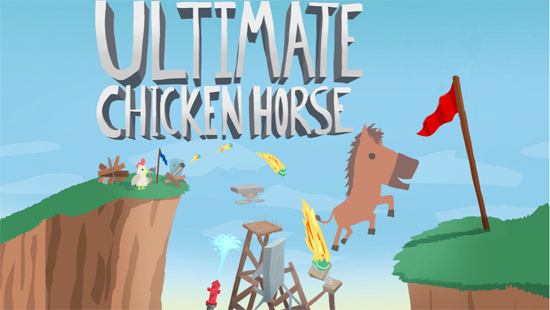 In Ultimate Chicken Horse, friends construct stages as they play, placing deadly traps before trying to reach the end of the level. If an animal can make it but their friends cannot, the one who reaches the end scores points! Play online or locally and experiment with a wide variety of platforms to find new ways to mess with friends.